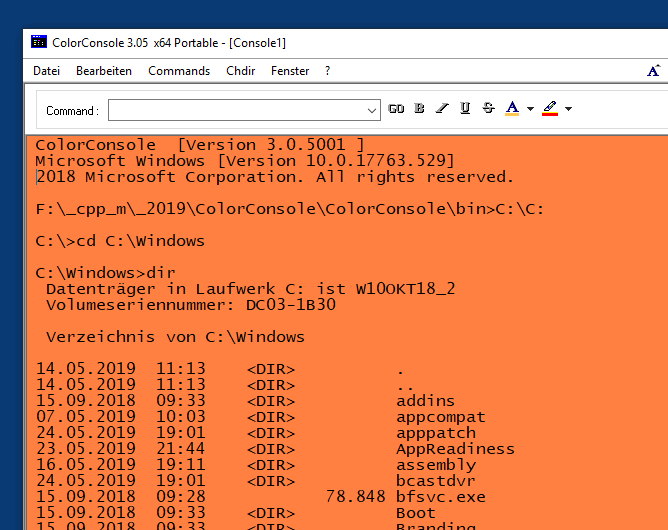 ColorConsole brings a little color to your black and white world of Windows console (cmd.exe), it is an alternative to the standard cmd! An installation of Color-Console is not required and can be executed easily from the desktop. 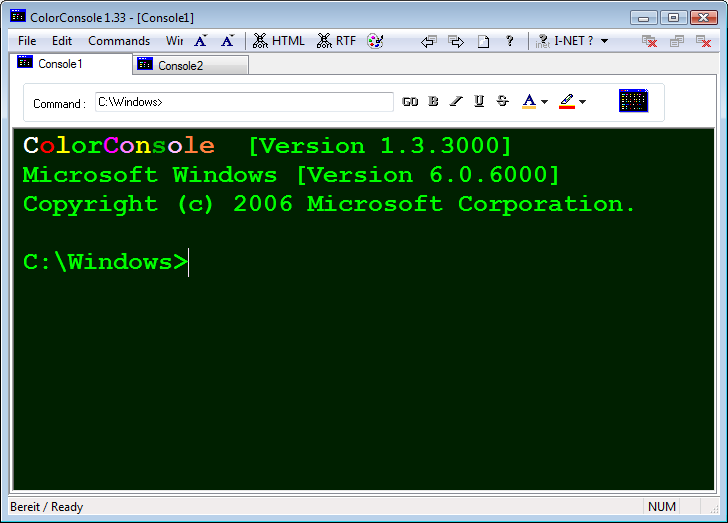 ColorConsole is a good alternative (extension) to the standard Windows operating system command prompt console. The program has a nice interface, there are customization for fonts and background from the selected colors, the fast switch for example the directory tree, export sessions in the HTML file or RTF document and much more. It is possible to open multiple input screens, switch via tabs interface, and view in MDI format. Therefore, it is possible to use another command while executing the command prompt result of a particular command. • Full Copy, Paste and Cut Support. • Tabbed working with multi cmd.exe. • Fast change directory command. • Power Shell commands support on Windows 10 / Server 2016! Suitable to be able to deal with the command prompt commands on all Windows Systems. However, requires the knowledge of an experienced user to use it effectively and correctly. The user has the ability to enter commands through a responsive field and a fast mode to navigate through internal directories. Color Command Prompt Console is a portable application, so it will not conflict with system Command Prompt. ColorConsole does not require installation, can easily be launched from the desktop with no installation and is ready to use on all Windows operating systems as an extension for Command Prompt. Preparation For multiple language files from Ver. 3:02! 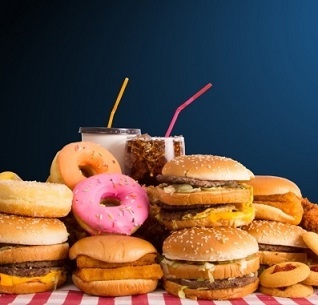 3,714 5,381 Nenad Hrg <img src="https://www.oldergeeks.com/downloads/gallery/thumbs/ColorConsole1_th.png"border="0"> Mar 02, 2019 - 13:08 3.01 91.9KB ZIP , out of 1 Votes.